They all give you a different sense of what the city is about. 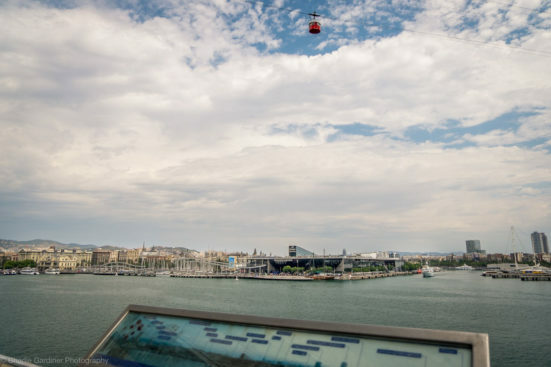 Whether it’s a waterside vantage point overlooking Port Vell and the luxury yachts cruising into their mooring spots, or the mountain top views from the old Spanish Civil War military bunkers that make the city below look like a cluster of toy houses all piled up on top of each other, there’s something for everyone. 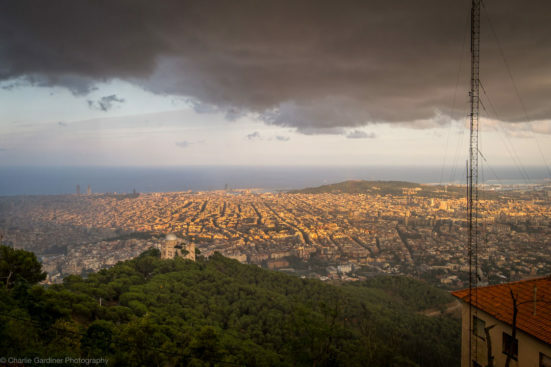 So, without further ado, here are my five best viewpoints in Barcelona for capturing the perfect photograph. 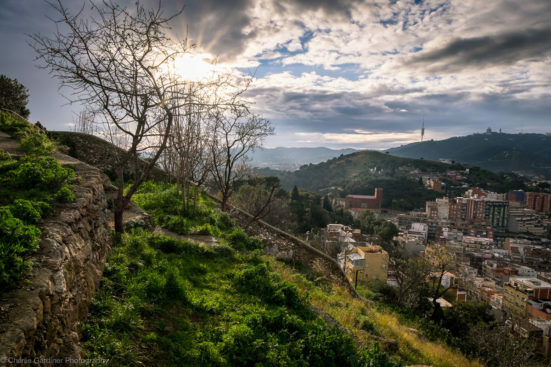 Probably one of the most well-known viewpoints overlooking the city, Bunkers del Carmel is where the military stationed anti-aircraft artillery during the Spanish Civil War due to it’s vantage point over the city. These days though it’s become a very popular spot to go with friends, a few beers and to watch the sunset. 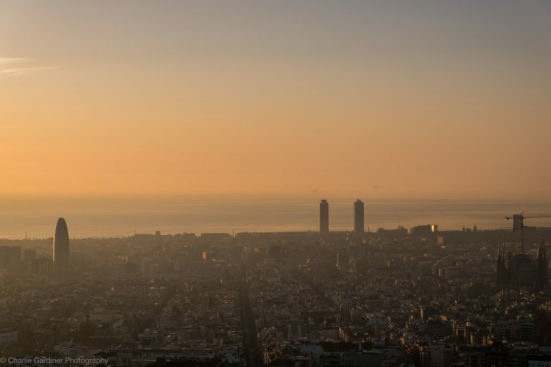 Because of it’s amazing view over Barcelona you can expect a pretty big crowd to be up there, especially in the summer months. The atmosphere is great though, people are listening to music, chatting and just generally enjoying this special spot. If you are a morning person and can get up there for sunrise, you’ll have the chance to photograph the sun rising over the sea which is absolutely stunning. 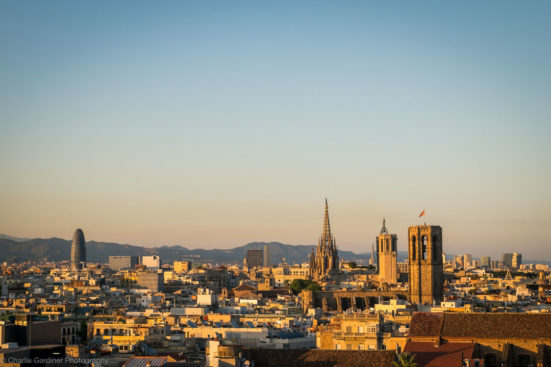 Tibidabo is another mountain that traps the city between itself and the sea, you will probably notice a church which is lit up at night on the top of it. It’s another well-known place for its views over the city. As well as the church there is an amusement park there, but I just go for the amazing views. I actually went there specifically to take some photos for this article and just as I got there it started to rain. Then this happened on the other side of Tibidabo. It just goes to show that you should never give up when it comes to photography! A mentor of mine once said, “bad weather is great, the best conditions to shoot landscapes often come just after a storm passes”. 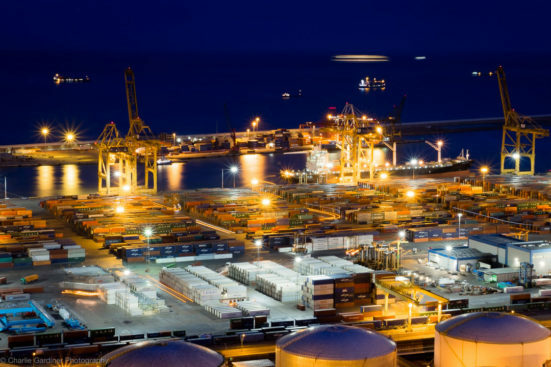 The World Trade Center in Barcelona is a building right on the waterfront at the entrance to the marina. It is mainly offices, a few restaurants for the workers and a hotel. It’s not really somewhere people go as it’s not in the direction of much else and there isn’t too much to do there. However, what most people don’t realise is that it has publicly accessible balconies that look out over the water. 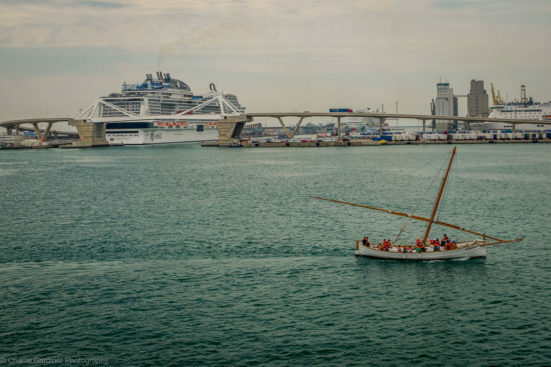 It has balconies on either side, facing North towards Port Vell where the smaller boats are, or South towards Montjuïc where the bigger cruise ships and cargo ships are. To get there you have to walk into the courtyard through the main entrance and up one of the staircases either to your left or right hand side. The Barceló Hotel found on Rambla de Raval is an odd-looking building when you first see it. It looks out-of-place surrounded by the more traditional style of architecture in this part of Barcelona. 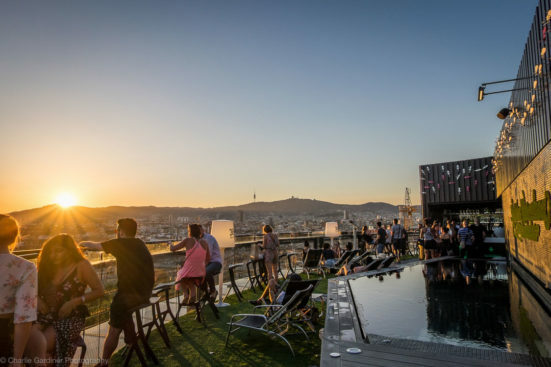 The main attraction though is the 360 degree views from its rooftop bar. Admittedly it’s not the cheapest bar in town, for obvious reasons, but I see lots of people up there who appear to have gone just to take a look. So if you’re on a budget you don’t necessarily have to have a drink, but if you do then it’s a great place to watch the sunset whilst sipping on a cold San Miguel. The last place on this list is a special one. 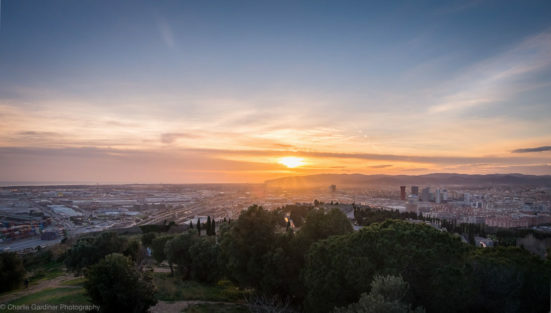 Montjuïc is a hill on the edge on the city centre that was completely transformed into what it is today as a result of the 1992 Olympics which were held in Barcelona. Many of the Olympic stadiums are still there and many parks/viewpoints were built for the occasion. The 1992 Olympics changed Barcelona in many ways but Montjuïc is maybe one if its biggest legacies. There are so many great viewpoints to be found, I’ve done a lot of exploring on Montjuïc and every time I come across something new I find myself totally shocked that I didn’t know about it before. There are so many hidden gems dotted around this big hill it would take forever to find them all! This is maybe one of my favourites though. It’s quite a walk to get there so really you need a car or bike, on top of that it’s almost impossible to explain where it is as Montjuïc is full of tiny roads that you can easily get lost on. In general though Montjuïc is littered with awesome viewpoints just like this so if you’re feeling adventurous (and up for a good walk!) then go and explore. If you find your own great spot to photograph the city from I’d love to hear about it in the comments! 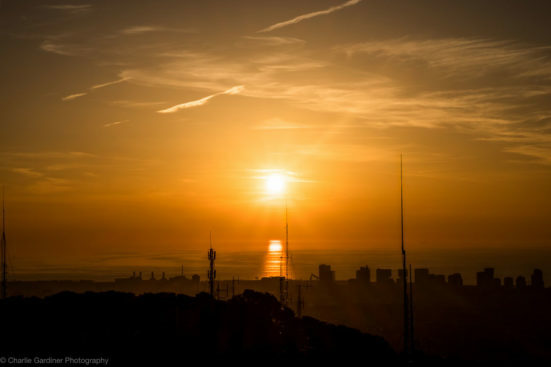 I hope that has given you some ideas of where you can watch the sunset/sunrise over Barcelona and get some great pictures. From a travel photography point of view, it’s a nice way to add some context to your trip. Instead of only taking pictures of the famous sights, it helps to convey a bigger picture of the city. Charlie is a travel photographer and founder of World of Travel Photography. 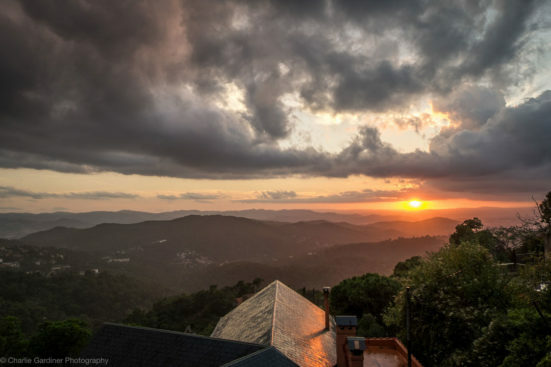 He has turned his love of travel and his passion for photography into a way of making a living. The last few years have seen him travel mainly around Europe documenting his adventures along the way. His blog has also transformed into a platform where content lovers and content creators can meet to share their stories. “It just goes to show that you should never give up when it comes to photography! A mentor of mine once said, “bad weather is great, the best conditions to shoot landscapes often come just after a storm passes”. Such great advice. 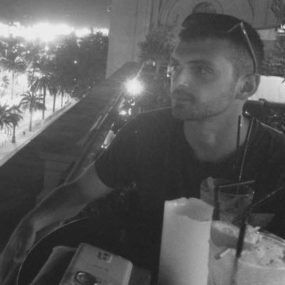 I’m headed back to Barcelona after a 9 year gap with two friends. Thank you for this great blog! Thanks Karstin! Glad you found it useful. I really hope you enjoy your return.